IBC drains everything out of you. Lots of noise. Lots to see. But you spend the day walking between halls. Will let it sink in before sharing views. Some interesting gadgets to come. 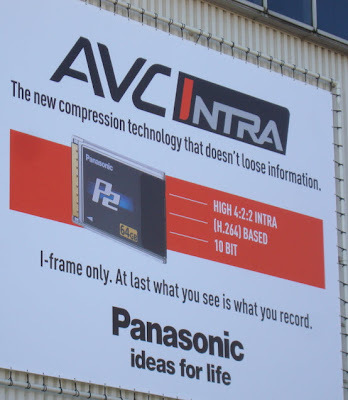 Panasonic gets the prize for making their stand at IBC 2008 the most identical to last year, hiding it near hall 8 and shooing away anyone who wasn't a "dealer" and having the largest advert outside Hall 11 complete with a spelling mistake. Impressed? I would argue that up until now, there has never really been any true interactive television. Yes, it is true that during the UK "National IQ Quiz" a few years back, the BBC and Endemol did allow people with certain types of set-top boxes to play along with the quiz. But the answers were stored on the set-top box and not sent back to the studio. They even put a delay in the software to simulate a "wait" so people thought their answers were being checked. It was in fact one way traffic. 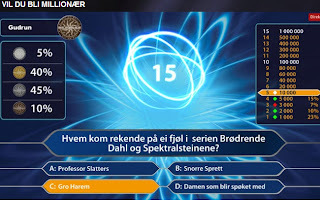 But last night on Norway's commercial TV channel TV2, a company in Bergen I consult to called Vizrt, launched a truly interactive version of "Who wants to be a Millionaire?". As the show played in the studio, viewers at home could play along in real time via the web, facing the same deadlines as the studio contestants. But their answers were stored by TV2's servers, so the producers knew how well the on-line audience was doing - and the results were shown on the screen. It seems more that 100,000 people managed to log-on with nearly 300,000 trying to do so before the servers reached capacity. Not bad for a show that usually scores around 700,000 TV viewers on an average week..half the TV audience wants to play along on-line in real time. Contestants either have a chance to win a car - or to be selected as a contestant on future shows....this is a great way for the producers to find clever candidates. Technology from Escenic, a company recently acquired by Vizrt, managed the profile of the online players through their new customizable community engine module. But this technology also means the contestants can not only "ask the audience" when they get stuck, they can ask a much larger on-line audience at home - a sort of "ask the nation" infact. While most solutions embed graphics within the video stream, resulting in lower resolution and non-personalized content, Viz MPS keeps the graphic and video content separate until the last minute. Compositing of the video and interactive graphics happens directly on the viewer’s monitor, with real-time, 3D graphics rendered locally by the viewers computer. To do this requires a quick download of a plug-in called Vizkey. I think they can take this concept a lot further. Take public broadcasting for instance. Lets say they have a feature on the credit squeeze. Not only can they get real time feedback to questions posed in the TV programme, they can launch small applications on the website which might ask you to put in your salary (anonymously) to get a graphical representation of how the credit crunch will affect you personally. So the viewer is able to query data on the TV station's server and have it personalised to fit their interests. This is an important function for public TV - and clearly a money-spinner for commercial networks. Labels: "Vizrt" "Who wants to be a millionaire?" TV2 "Interactive TV games"
This long version of the next ad for Windows Vista reminds me of a lot of the press releases I scanned at IBC 2008. I just don't get it. Moreover, I don't think the audience gets it. Please prove me wrong. People much more important than me have been talking about digital radio, just as the IBC exhibition opens in Amsterdam. On the World DMB stand in the EBU pavilion here at IBC both EBU and WorldDAB have just officially announced that the European consumer will "in future be able to buy receivers which will provide them with digital radio services across Europe". Bascially, broadcasters can now plan around any of the standards with confidence, safe in the knowledge that these new digital radios will receive their services....providing the standard is one of the variants of DMB/DAB. This is not the same standard as DVB-H, a standard for mobile media being pushed by the likes of Nokia and supported by Viviane Reding, the member of the European Commission responsible for Information Society and Media. People on the EBU stand explained that this was not the same - although to me it is all portable media. Last year at IBC2007, the DVB-H camp declared a sort of standards war on the the DMB camp. Since then, the DVB-H trials in Germany have hit all sorts of snags (lack of receivers). But in Holland, KPN is starting to roll out a DVB-H service alongside its launch of the Nokia N96 into the market this month. The WorldDMB Digital Radio Receiver Profiles specify a set of minimum requirements and features to be built in to different classes of digital radio receivers, ensuring the interoperability of all new digital radio receivers across European countries whose broadcaster are using either DAB, DAB+ or DMB. Together these are known as the Eureka 147 Family of Standards.. I note that DRM and DRM+ seem to be absent from this set, despite agreements at IBC in 2005 that DMB and DRM would work more closely together. The WorldDMB manufacturing specifications comprise three complimentary Digital Radio Receiver Profiles: the Standard Radio Receiver (Profile 1) expected to drive the price-sensitive mass market for radio devices; the Rich Media Radio Receiver (Profile 2) for table-top radios with colour screens able receive audio, advanced text and picture applications; the Multimedia Receiver (Profile 3) for devices such as mobile phones, personal media players, able to receive advanced forms of multimedia including mobile video. Features and functions appropriate to in-car systems are also defined including automatic retuning between digital and analogue services, and advanced travel and traffic services for real time satellite navigation. These Profiles will enable drivers travelling across boarders to receive all Eureka 147 digital radio broadcasts on their car radios. 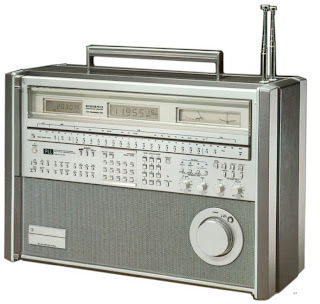 The announcement will ensure that digital radios bought in France, for example, also work in Germany, Italy or Norway and vice versa, and will apply to any country in Europe or beyond using the WorldDMB Eureka147 Family of Standards. It was wierd that this announcement was embargoed with a dual time zone....embargoed until 12.00 says the press release, and then mentions Geneva and London as the dateline. I'm assuming 12 hrs Amsterdam time, althought I fear this news is not going to stop many presses. Design plays an even more important role in consumer choices these days. Yes, my Toyota Prius car does not have a DRM/DAB capable receiver as part of the dashboard navigation system. But would I swap it for an aftermarket receiver that does? At the IFA in Berlin a few days back, there was a DRM capable car radio on the DRM stand. The press statement says the "Russian Sarapulsky Radiozavod SRZ RP – 229 DRM is a prototype ready to go in production". Hmm... can you imagine the scene at the local garage when you arrive with this thing to do the swap? Neither can I! If they don't do something about the design DRM will stand for Design Ruins Medium. Labels: "DRM car radio" "Sarapulsky Radiozavod SRZ RP"
I see that shares in Worldspace (WRSP) have dropped below US$1.00 dollar a share. Remember when they started trading publicly in August 2005 at $24.10 a share? The official Worldspace press releases still say they are the "only global satellite communications company positioned to offer crystal-clear radio to listeners in more than 130 countries", yet the number of global subscribers is a mere 171,657 up by 187from the previous quarter. They have announced a cessation of marketing efforts in India and other parts of the world ahead of the Company’s efforts to launch its mobile service in Europe in 2009. In India, the Company gained 2,283 net subscribers during the second quarter of 2008, even with substantially reduced marketing spend in that region. 1worldspace ended the period with 164,309 subscribers in India, compared with 162,026 at the end of the first quarter of 2008. Now the focus seems to be on building a "terrestrial repeater network in Germany. The repeaters will work in conjunction with the 1worldspace existing satellite network to provide German consumers with a subscription-based satellite radio service to automobiles, starting sometime in 2009". On July 24, 2008 1worldspace secured $20 million of subordinated financing from Yenura Pte. Ltd., a company controlled by Noah Samara, chairman and CEO of 1worldspace. Approximately $18.5 million was used to meet the terms of the July 25, 2008 financing terms reached with its investors, leaving approximately $1.5 million to make certain payments owed to vendors and other persons. For the second quarter of 2008, 1worldspace reported revenues of approximately $3.3 million, a slight increase over revenues of approximately $3.0 million for the first quarter of 2008. Subscription revenue was approximately $1.8 million for the second quarter of 2008, compared with approximately $1.9 million in the second quarter of 2007. On a sequential basis, subscription revenues in the first quarter of 2008 were approximately $1.7 million. Total operating expenses for the second quarter of 2008 were $33.1 million, a 26.5% decline from operating expenses of $45.0 million in the second quarter of 2007, primarily reflecting reduced marketing activity in India, as well as decreased compensation and lower professional and legal fees in the 2008 period. As of June 30, 2008, the Company had cash and cash equivalents of $1.2 million, along with restricted cash and investments of approximately $4.8 million, compared with $2.0 million and $5.6 million, respectively, as of March 31, 2008. Anyone can see that these numbers are unsustainable. They are definitely "Lost in Space"
Some people are sitting around talking about citizen journalism. YouTube just announced a partnership with Pulitzer Center, Sony and Intel to put 10,000 bucks on the table for the best untold story. They are putting the video below out as a source of inspiration. Not sure why they have restricted it to entrants from the countries where YouTube is localised, i.e. Australia, Brazil, Canada, France, Germany, Ireland, Italy, Korea, New Zealand, Spain, The Netherlands, the United Kingdom (England, Northern Ireland, Scotland and Wales), and the fifty United States and District of Columbia. More rules posted here. Just finished a long report, so its nice to see some graphic data that's not too serious for a change. Graph Jam is great. BBC News has just "adopted" a shipping container and is planning to track its progress for a year as it travels the globe. In an ambitious and innovative experiment BBC correspondents will follow the container as it criss-crosses continents with its various cargoes telling the stories behind those goods, those who make them and those who consume them. The 40-foot branded shipping container begins its worldwide journey today from Southampton. The project, called The Box, will follow the container as it transports real goods, from car parts to footwear, in a genuine snapshot of global trade. Visitors to the BBC News website can interactively track the progress of the trailer online in real time through GPS tracking at bbc.co.uk/thebox. Jeremy Hillman, BBC News Business and Economics Editor, said: "The Box will highlight major issues and trends in the global economy at a critical and testing time. "It is a creative, exciting project which will provide depth to our coverage of the credit crisis and global economic uncertainty. The Box will first travel to Scotland to be loaded with whisky and then put onto a container ship bound for China. The idea of The Box comes from a book of the same name by Marc Levinson which tells the story of how the humble shipping container changed the face of world trade. 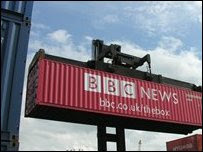 The Container Shipping Information Service (CSIS) are working closely with the BBC on logistics and planning. Its journey will be picked up at each stage by BBC correspondents around the globe bringing their expertise and reporting to a remarkable journey. It is an interesting idea, although I am not sure the container is going to make a "remarkable" journey. Its going to be pretty easy to spot with that flaming great logo on it, so I guess it won't get involved in transporting anything controversial. Forget about Rickrolling, Hugh Atkin and Alastair Corrigall did some clever montage work to ensure that John McCain gets BarackRoll'd. I owe a lot to a small team in the English section of what was (ORF) Austrian Radio's international radio service. For they gave me a break I couldn't have had in the UK in the mid 70's - I was simply too young. In 1976, a team of four staffers and a handful of freelancers moved from studios in wooden "barracks" in the Argentinierstraße to the wing of the brand new ORF Centre in Vienna's 13th District (the centre of the photo on the left shows one of the former SW studios on the Würzburggasse). I was one of those freelancers, given the chance by the boss of the department, the late David Hermges, to take a year off between school and university and come and give broadcasting a try. I confess, I enjoyed those 14 months in Vienna immensely. I took a risk by paying 29 pounds for a single ticket from London to Vienna - with only a smattering of schoolboy German. I survived on writing pieces for Report for Austria and for a programme on Sundays called "Austrian SW Panorama". This was two decades before the public Internet and Skype, when an international telephone call was unheard of, and there was still magic in distance. ORF's international service ran half hour carousels of programmes in Englsh, French, Spanish, German and a smattering of Esperanto. I got to know Wolf Harranth, the media editor on the German service. I discovered a goldmine of fascinating material that he, together with a band of loyal listeners, had been collecting on the airwaves. More that 30 years on, I am glad to say that this media collection has been preserved and catalogued by Wolf and a band of volunteers. With over 3 million items, the centre in Vienna houses the most comprehensive collections about short-wave broadcasting in the world. 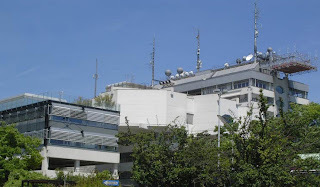 Those days in the mid-70's, when Austria had many reasons to communicate with the outside world (its large "UN city", its proximity to the Iron Curtain, and its neutrality") the ORF Auslandsdienst was just a brilliant place to work. Sadly, in the 90's it didn't move with the times and gradually the foreign language programmes were trimmed - now English is 15 minutes a day, Spanish is 5, and French a mere 3 minutes a day! It has reached a stage where there's not much point. Now, another round of budget cuts will mean ORF becomes monolingual again at the end of 2008. If you look at the current single page in English, it is a mashup of German and English and the reception report form shows they have lost their way..reception quality has been mixed up with reception location. It is a shame they never found the budget to build a sort of audio Wikipedia of Austria using all the material they made - hundreds of hours a year if you think about it. Happy Memories, for me, though. I shall always be grateful. Great friends - both in Vienna and in the audience around the world. Labels: "ORF Auslandsdienst" "OE International" "Wolf Harranth" "David Hermges" "Austrian SW Panorama"
Interesting new weblog tucked away in Southern England out there on the Interwebs. The Independent Local Radio [ILR] blog reflects work in progress on three ILR projects lead by Professor Sean Street Director of The Centre for Broadcasting Research, part of The Institute for Media and Communication Research in the The Media School, Bournemouth University. * The LBC/IRN Audio Archive (1973-1992). 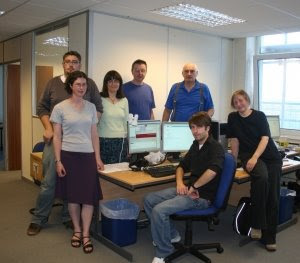 Funded by the Joint Information Systems Committee [JISC] Digitisation programme - due in July 2009. The British Universities Film and Video Council [BUFVC] is hosting the final project outputs, which will be searchable as individual resources and across all three projects. While we work towards building the finished resource, this blog will share expertise, early views on digitised content and be a focus for communication with the many interested people in academia and in the radio industry. Labels: "Independent Radio weblog" "Sean Street"
Oh dear, what were they thinking when they came up with THIS? Can you imagine the ad meeting to discuss the storyboard? No? Neither can I. Did the earth move in the last 90 seconds? Er no. Why not give some free software away to those who really need it? I cannot believe this tested well anywhere, can you? I hate Apple's arrogance, especially around iTunes. There are programs I prefer on the Windows platform - Skype, Sony Vegas Video, and the new Google browser (only on XP/Vista). But this commercial does justice to no-one. They should have paid the $10 million Microsoft is paying Jerry Seinfeld for an endorsement to a lucky member of the public who could prove they did something interesting with Vista. I note on Youtube (and in this blog) comments paying tribute to the passing of Hal Douglas, the guy who has done countless movie trailers, including the parody trailer for the film "The Comedian". Hal may be 84 by now, but he is still alive and well and living in Northern Virginia last time I checked. It is Don LaFontaine who passed away on Monday (see below). Labels: "Hal Douglas" "Don LaFonteine"
In the run up to a name change on October 1st 2008 (when they dump the name Matsushita Electric Industrial and just become Panasonic), an on-line museum of design has opened. Not sure where in Europe it is coming from, but its an interesting selection of Panasonic designs through the last 90 years. During the time that I tested radios for Radio Netherlands "Shopping List" I recall that the Panasonic shortwave portables were usually robust but not at the leading edge...perhaps with a few exceptions. For a time the RF-4900 with its digital frequency readout was a great tabletop and then there was the RF9000 (1982-1985) which cost something like 3000 Euros in its day and was basically designed to show what Panasonic could do in the labs. I am a bit surprised they didn't pick that for the on-line museum. It was an amazing set - I wonder what kind of customer they had in mind? In Holland they put a few into luxury yachts. By the way, the museum is an interesting tour, but the navigation is a nightmare - Flash design on steroids. And sadly, no search, so the content is there, but the context is often missing. Worth a short visit though. Labels: "Panasonic Online Museum" "RF9000"
Always amazed by start-ups on Dutch soil. These guys in Haarlem have come up with a clever scheme to reclaim the tax and (fuel) charges on an air ticket that they wasn't used. Authorities charge airlines based on the number of passengers who fly, not the numbers that book tickets. Unfortunately, airlines don't make it easy for consumers to claim the refunds they're lawfully entitled to. But that's exactly what newly-launched Miss Refund does: claim taxes and charges on flights passengers didn't take, in return for a flat rate of 25 EUR0, no cure, no charge. Customers fill in their personal and flight details on the company's website, and Miss Refund contacts the airline to claim airport taxes and other refundable surcharges. Trendwatching.com, who originally put me on to this, says the company has processed hundreds of claims in the short time its been operational (a couple of weeks at this point), claiming back anything from 60 to 600 Euro. Owner Iwan van Geelen, also has a clever service to allow people to check in to a flight and get the best seat. For a fee of 7 Euro, CheckMeIn will manually check you into the flight the moment it opens - trying to book your favourite seat with the most legroom. Labels: "Miss Refund" "CheckmeIn" "Iwan van Geelen"
The world is missing a voice this evening. And what a voice it was. Great video on Youtube profiles the "luckiest man on earth", his words not mine. He had a great voice and could command the big bucks for it - but he also surprised some of his fans by doing something for their answermachine, when time permitted. He was 68. Vanessa Gilbert, his agent, told reporters that LaFontaine died Monday at Cedars-Sinai Medical Center from complications in the treatment of an ongoing illness. LaFontaine insisted he never cared that no one knew his name or his face, though everyone knew his voice. LaFontaine went on to work in the promo industry in the early 1960s. As an audio engineer, he produced radio spots for movies with producer Floyd Peterson. When an announcer didn't show up for a recording session in 1965, LaFontaine voiced his first narration, a promo for the film, "Gunfighters of Casa Grande." The client, Metro-Goldwyn-Mayer, liked his performance. LaFontaine remained active until recently, averaging seven to 10 voiceover sessions a day. He worked from a home studio his wife nicknamed "The Hole," where his fax machine delivered scripts. LaFontaine is survived by his wife, the singer and actress Nita Whitaker, and three daughters. The best impression of Don must surely be from Pablo Francisco. Talking of reinventing a brand.... Telefunken used to be a brand of radios and transmitters in Germany. Then the name disappeared, but now its back. But what is it now? Ask the French company Sopeg, currently exhibiting at IFA in Berlin and they tell you Telefunken means a number of digital picture frames with screen diagonals ranging from 3.5 to a massive 32 inches, as well as the Magic Window system for simultaneously presenting four different images. Two picture formats are available, the 16 : 9 units also being suitable for playing back videos. It's like having a telly on the sideboard. There is an added twist for one frame which uses DECT technology to connect it to a cordless telephone. If the picture is properly tagged inside the 128 MB flash memory, then that picture will be displayed when the callers rings up... a sort of mega Caller ID. 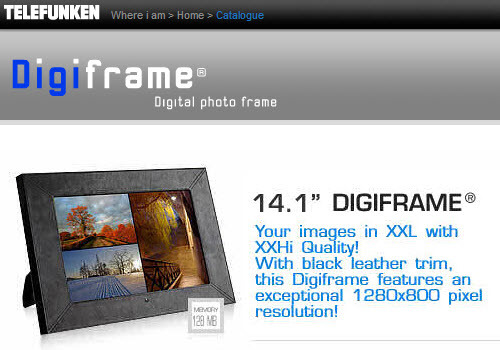 A similar frame with internet capability will be available in 2009. Roman Hartrampf, Product Manager for the German distributor Intron Electronic has obtained the rights to the brand name Telefunken for the audiovisual sector and will be bringing a new range of ten to 15 audio devices on to the market in time for Christmas. Some of the prototypes, including a 2.1 Design Sound system, are already being exhibited at IFA. Remember 2005, when Telefunken SenderSysteme Berlin AG changed its name to Transradio of SenderSysteme Berlin AG when it lost the right to use the name? I thought it was simply a translation of Telefunken into English, but they say the name "Transradio" can be traced back to before the year 1918. There are three of these viral ads, based on Gordon Ramsay's Hell's Kitchen. I think the first the funniest. Fabulous? No, the new name for Virgin Radio in the UK and beyond is Absoluteradio. The name is being phased in now and Virgin is to be dropped by their new Indian owners by October 1st. Hmm. May be they tried too much of what is at www.absolut.com to come up with that one. Remember Yorin in the Netherlands? Neither do I. Perhaps they are trying to get higher than the BBC in the menu driven electronic programme guides, rather than being stuck at the bottom? Will there be a similar http://www.boycottabsolut.com/ (yes it exists)? We'll see. "Just gone three minutes past eight here on absolute and it's raining here....." Nah! Labels: "absoluteradio" "Virgin Radio" "Absolute" "Radio"